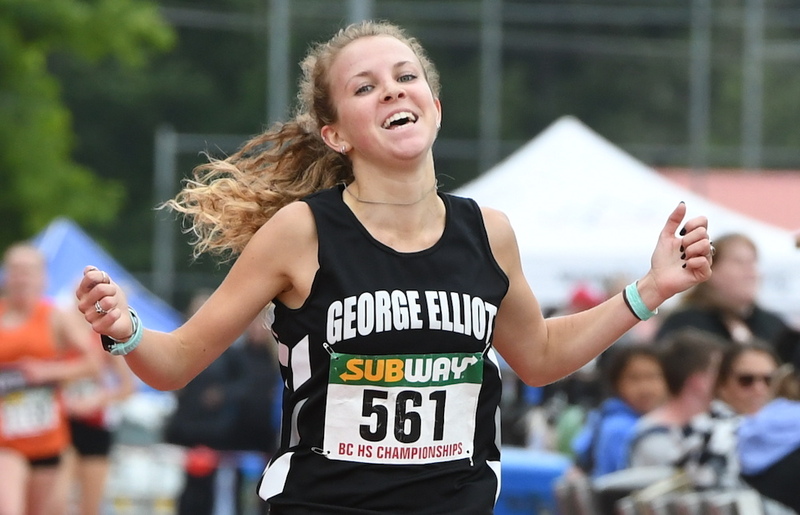 LANGLEY — If you are a high school track fan with any degree of long-standing membership here in the province of B.C., you may have taken, over the course of the weekend past, a few moments to determine in your own mind just how significant the accomplishment’s of Taryn O’Neill really are in the grand scheme of our sport here in B.C. In case you hadn’t heard, in a span of just under 24 hours beginning mid-afternoon Friday, the 17-year-old senior from Lake Country’s George Elliott Secondary School not only won the senior girls 1,500m race one day and followed it by winning the 3,000m race the next, she set new provincial championship meet records in both as Langley hosted the B.C. High School Track and Field Championships at McLeod Athletic Park. And perhaps most impressively, she didn’t just squeak out new standards. She established what can best be described as healthy new standards. *In the 1,500 metres, a race won in past years by a number of soon-to-be Canadian Olympians, a standard of 4:26.44, set in the heats by Burnaby Central’s De Geest, had stood unconquered since 1995. O’Neill, without a real push from the rest of the field, topped it easily in 4:23.02. 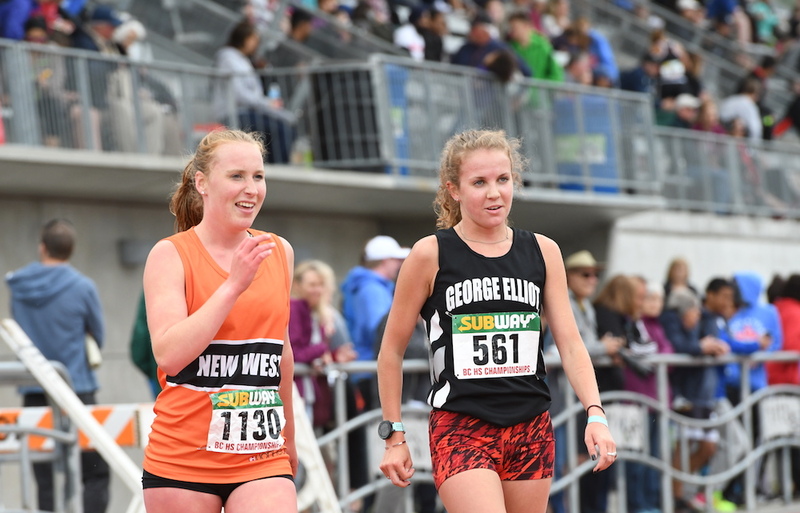 *In the 3,000 metre race, Vernon’s Hannah Bennison had put forth a landmark performance in 2015, her 9:33.44 looking like a generational record in terms of its staying power, especially after it’s former record-holder, Mt. Boucherie’s Brenda Shackleton, had seen more than a generation of runners fail to break the 9:37.20 she set back in 1984. Yet just three years after the new record was set, and a day after she set the 1,500m record, O’Neill again established her own pace, finishing almost nine seconds faster in a head-spinning time of 9:24.82. In B.C. girls high school middle distance running, all of these past names and more have come to represent the cream of the canon, each with their own unique place as part of a pack that has produced generations of collegiate and national team stars. Yet in a span of 24 hours, a humble, 5-foot-3, 17-year-old high school senior who has faced all level of adversity the past few seasons, twice answers the starter’s pistol and in the process sets a new bar for all in B.C. to follow. The first thing I say to Malindi Elmore is that Taryn O’Neill’s performance over the weekend at Langley’s McLeod Athletic Park might be the single most impressive feat in B.C. girls high school championship meet middle distance history, especially considering the margins by which she set her records. “I don’t even know if there has ever been a high school girl to do that ever in Canada,” responds Elmore, the 1998 Kelowna Secondary grad who starred at Stanford and ran the 1,500m for Canada at the 2004 Athens Olympics. What she means is that O’Neill’s 9:24.82 in the 3,000m was more than a B.C. meet best. It was, in fact, the new Canadian high school record. That is, it’s the fastest a female has ever run the distance in a Canadian high school meet. The performances that bring up the best comparison? In 1990, Handsworth’s Lori Durward set the new record in the 800m at 2:08.61, a record that 28 years later still stands. That year she also clocked a 4:26.79 in the 1,500m final, winning the gold medal in what was a new meet record time. It would stand until 1993 when Claremont’s Shannon Bowles would lower it to 4:26.48. Two years later, Burnaby Central’s Heather de Geest would shave fractions off the time as the record would begin to gather dust. As well, in 1976, Claremont’s Debbie Scott set the 1,500m meet record at 4:34.76 and also won the 3,000m (9:95.62) which was being introduced for the first time at the provincial meet that season. All of this, when placed against the ebbs and flows of McNeill’s, say, past four seasons, paints the picture of a determined athlete who has always seemed to know that if she could ever find a sweet spot of time in which she could parlay her training and the coaching expertise she was receiving, that great things would be possible. No surprise then, that as O’Neill — named the meet’s Top Female Athlete — begins to talk about her weekend past, the first thing she states is the mantra that both she and Elmore decided to place front-and-centre in their efforts this season. Hear those kinds of words and you know there has been more than a little adversity along her path. 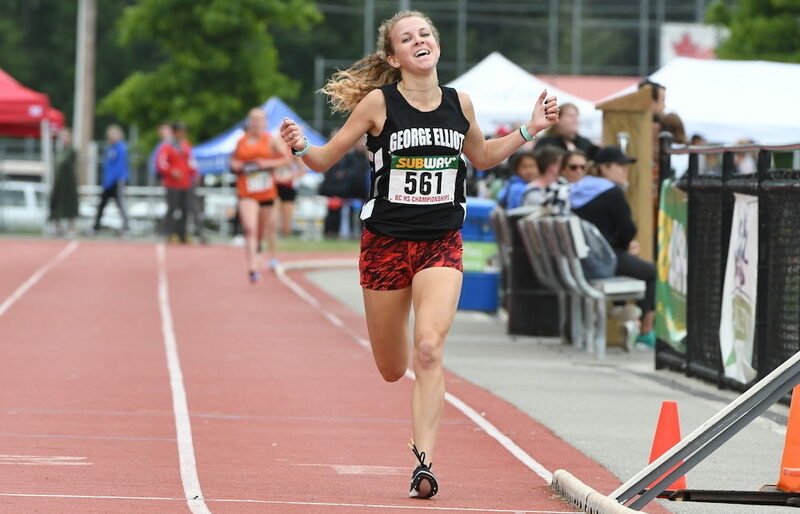 Last season, in finishing second in the 1,500m at provincials to Cowichan’s Grade 12 Desirae Ridenour, O’Neill posted a time of 4:30.09. In many years it would have been swift enough for gold, yet in so many ways that time would wind up being an outlier amidst a number of blue-chip outings to follow, all of which seemed to strongly hint that O’Neill had the meet record in her sights. First was the 4:22 she ran at the Harry Jerome just weeks after the high school provincials. And then this season, at the Portland Twilight meet on May 12, she turned in a personal-best 4:17.93. Quite incredibly, O’Neill is fortunate to have a former Olympic 1,500m runner as her coach and mentor. And Elmore, for one, has first-hand knowledge of just how tough a task it is to break De Geest’s 4:26.44 from 1995. Consider this race’s incredible heritage. West Vancouver’s Brit Townsend, the SFU coach, won the race in 1975 on her way to the 1984 Los Angeles Olympics. Elmore followed in 1998 on her way to the 2004 Athens Games. And Argyle’s Jessica Smith won in both 2006 and 2007, later qualifying for the 2012 London Olympics in the 800m. And Claremont’s Scott would represent Canada at the Los Angeles, Seoul and Barcelona Games, highlighted by Seoul where she made 1,500m and 3,000m finals. Soak in all of that along with her work ethic, and it’s fair to include O’Neill, the events record holder, in any conversation of B.C. athletes with the potential to follow in those footsteps. Nine times over its history, which began in 1976, the title has been won either two or three times by the same racer, suggesting the potential record-setter would be someone defending her title. Yet as far as setting its record, that hasn’t been the case. For starters, there is no telling how fast Bennison would have been at the meet as a senior. After setting the record as a Grade 10, she missed in Grade 11 due to injury, and last season, the Providence College-bound senior elected to pass on the meet to take part in her school’s grad festivities. O’Neill placed second in the 3,000m last season as well, again behind Ridenour, but like her 1,500m time in the same meet, the 9:44.55 she clocked that day was not representative of where she was headed. In fact, coming off a slight tweak in her back, O’Neill was off of her top form 12 months ago. 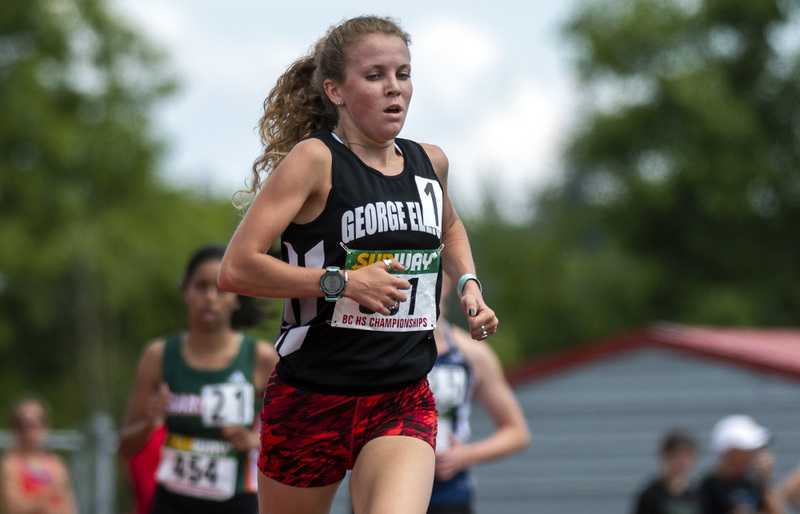 Yet on the quick mend, she basically ran what amounted to a solo time trial at a Langley meet two weeks after the 2017 provincials, clocking a 9:28 which qualified her for last summer’s Pan Am U-20 Games. There, she finished second at 9:22.05. Quite suddenly, the compact 5-foot-3 dynamo from Winfield was popping up on the radars of major NCAA Div. 1 programs all over the U.S., eventually choosing Villanova University, where the Wildcats have a renowned cross-country and middle-distance history. As I crouched at the finish line of the senior girls 1,500m final last Friday at the B.C. high school championships, I captured the cover photo of O’Neill that accompanies this story. The arms are raised, and the smile is unmistakable. Seems she’s got a lot to be thankful for. “Well, a few years ago, I was close to quitting track and to come this far in this short of space of time is kind of unthinkable,” she says, making a solid case for that smile. Ninth grade brought an achingly slow-healing stress fracture in her femur, and she couldn’t get her body feeling the way she wanted to find that all important stretch of consistent training. Eventually she got her stride back, but then the cycle hit again this past fall following her Pan Am success. An extended illness was followed by a broken arm courtesy of a mountain biking accident. O’Neill was forced to miss the cross-country season because of it, and she barely ran from September through January. Which brings us back to that smile. And beginning this fall, on those Villanova cross-country trails just outside Philadelphia, Taryn O’Neill will begin to map out the next part of her running journey. When she gets asked about that smile, it seems certain that her response will mirror the one she had after setting that new 1,500m record last Friday.